This recipe makes a very tasty roast or loaf that is high in protein and very cheap to make—especially in contrast to the veggie roasts you can buy. It’s one of the ways I can get my husband to eat garbanzos—because it doesn’t taste anything like them. It would be very easy to make soy-free as well—just add more salt in place of the soy sauce and use a soy-free beef seasoning. Soak garbanzos until fully soaked (at least 4 hours, overnight best). Drain and blend with oil, 1 cup of the water, soy sauce, and all seasonings on high until fine. Pour into bowl, and rinse blender with remaining ½ cup of water, adding to mixture. 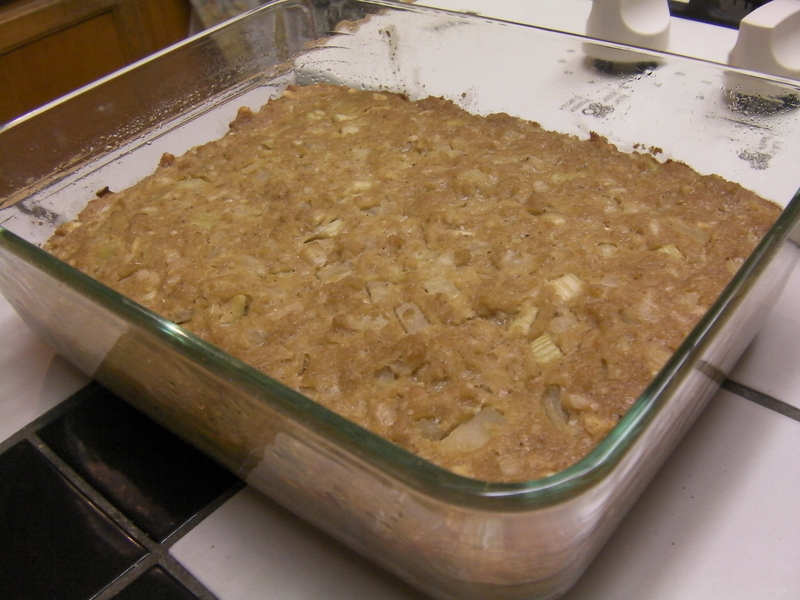 Add onion, celery, nuts, and wheat germ and mix. 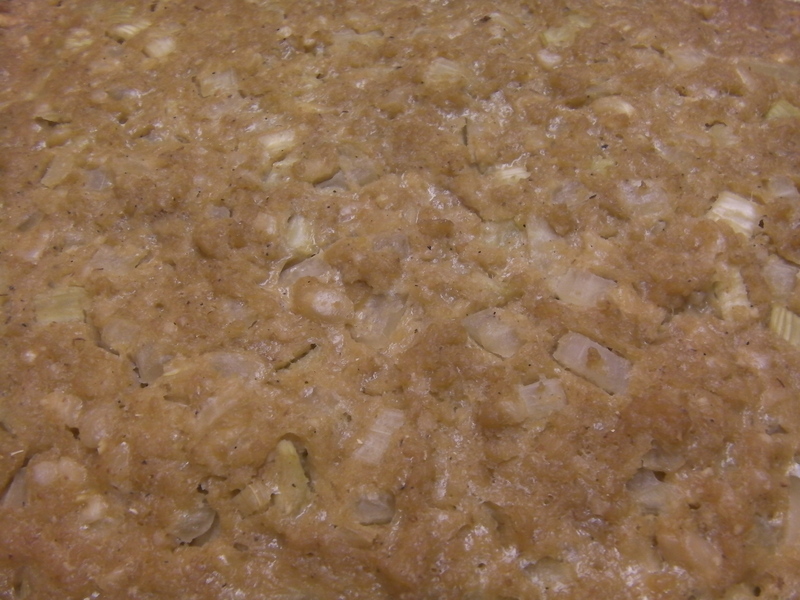 Stir in gluten flour and beat until gluten develops. This will take several minutes. You will notice the mixture becoming stringy—that is when the gluten is ready. It won’t get stiff until it bakes. The garbanzos thicken as they cook. Put into greased glass loaf pan or medium sized baking dish, cover with foil, and bake for 1 hour at 350°. Remove foil for last 15 minutes to allow roast to brown on top. Serve hot. Reheats well. This is a great potluck dish. Or if we’re eating it at home, I will serve it with rice—wild rice is my favorite—and a vegetable. It is very satisfying. It could be sliced and served with gravy, though it has plenty of flavor on its own. The pieces of nuts add interest, though they could be ground with the garbanzos for a smoother texture. The original recipe didn’t call for beef seasoning, but I found the recipe needed a little more seasoning than it called for—at least, for our family. Before trying this recipe, I had never tried making anything with raw soaked garbanzos. I was surprised how wet the mixture was—nearly pourable, nothing like any roast I had ever made before. But then I saw in the book that you can use raw soaked garbanzos blended up to thicken things. I actually thickened pumpkin pie with them once! They can be blended and frozen ahead of time as well. Just a tip that you might find handy some day. Next week I’m going to share the recipe I love for chicken nuggets. A friend of mine posted the recipe on Facebook, and it was the end of my quest for a good chicken nugget recipe! Watch for it! This recipe is my slightly modified version of the recipe found in the Oats, Peas, Beans, and Barley cookbook. First time comments are moderated. Please do not submit your comment twice. It will appear after approval. If you have commented before, it should appear immediately. Come See What I'm Selling!